This is going to be another recipe designated as “healthy.” It happens to involve lentils again, and I’m sorry for the lack of variety so far in that department. I swear I’m not that obsessed with lentils. Though it is impressive how satisfying they can be, acting as a protein-provider in the absence of meat. Vegetables are the star in this one. Let me talk a little bit about the ingredients. 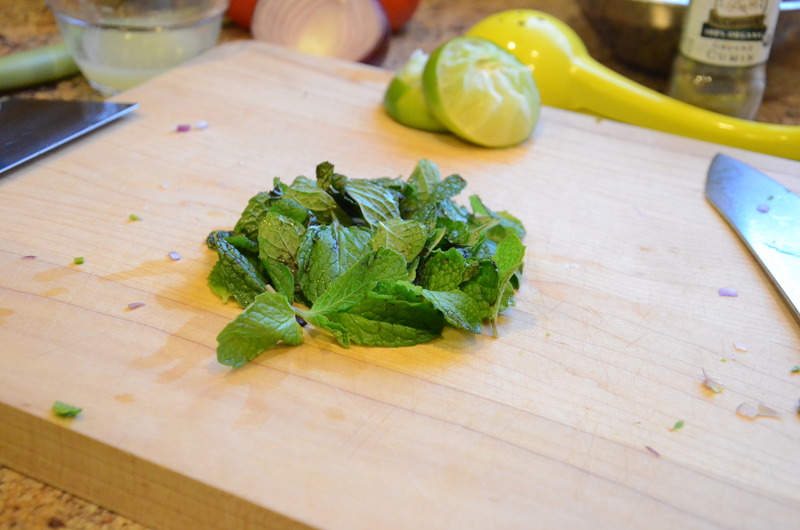 This recipe calls for another one of those herb bunches, this time: mint. I had bought the mint a few days earlier, actually, to use in a recipe for chicken biryani. Where is this recipe, you ask? Well, it wasn’t exactly…good. My version of this Indian rice dish with spices turned out bland! There were a few problems. Even though I went as far as to use some whole spice freshly ground, I didn’t have all of the exact spices. (Apparently, BLACK cumin seeds are a critical ingredient in garam masala). And I was cooking with a friend with whom I was also catching up, and I was distracted and didn’t taste until it was too late (thank goodness Tom Colicchio wasn’t judging). We all ate it anyway, of course, with the help of good old pepper and salt. Perhaps I’ll try this again and apply what I learned and tell you about it then. Please forgive the white balance problem with this picture. One of these days I’ll work on photo editing. 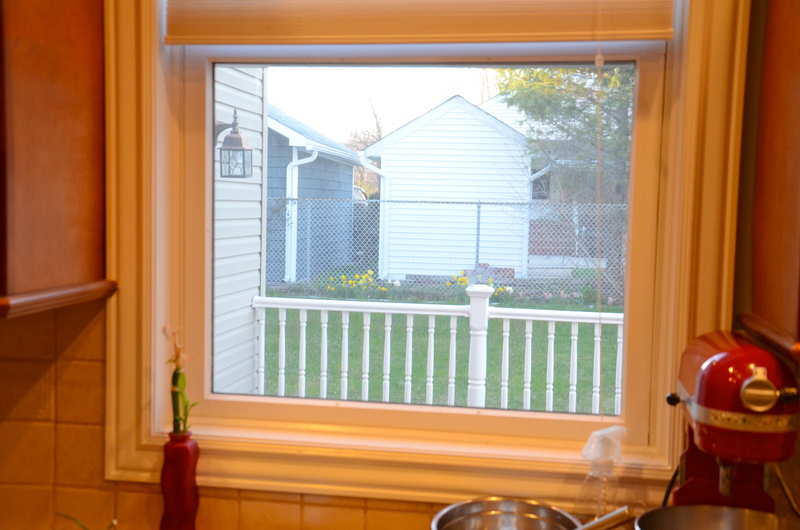 My kitchen window frame and walls are not actually that yellow-orange. And I love, love, love keeping goat cheese on hand. I can eat that stuff with almost anything–greens, vegetables, legumes, grains, pasta…you name it. Remember, I had it on the kale pizza last week. In 4-quart covered saucepan, heat 6 cups water to boiling on high. Stir in lentils. Reduce heat to maintain simmer. Simmer, covered, 25 to 30 minutes or until tender, stirring occasionally. Drain well. 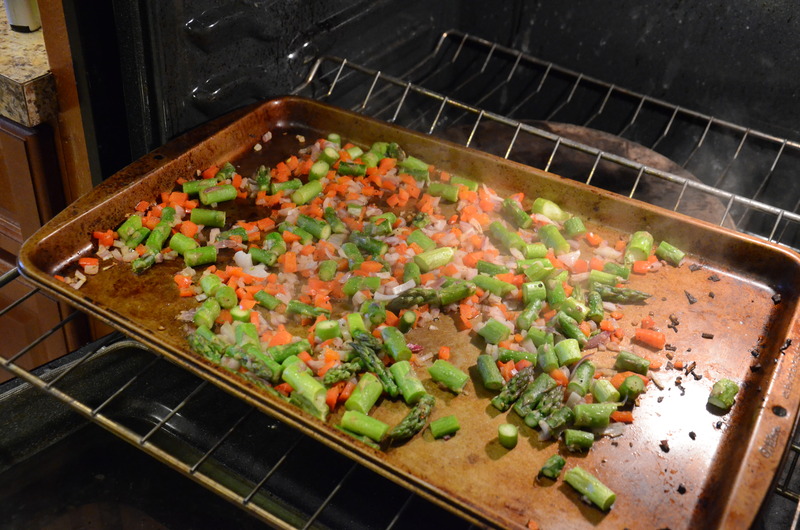 Meanwhile, in large jelly-roll pan, toss asparagus, red pepper, and onion with 1 tablespoon olive oil (regular olive oil stands up to heat better), 1/2 teaspoon cumin, and 1/4 teaspoon each salt and black pepper. Roast 18 to 20 minutes or until tender, stirring and turning pan halfway through. 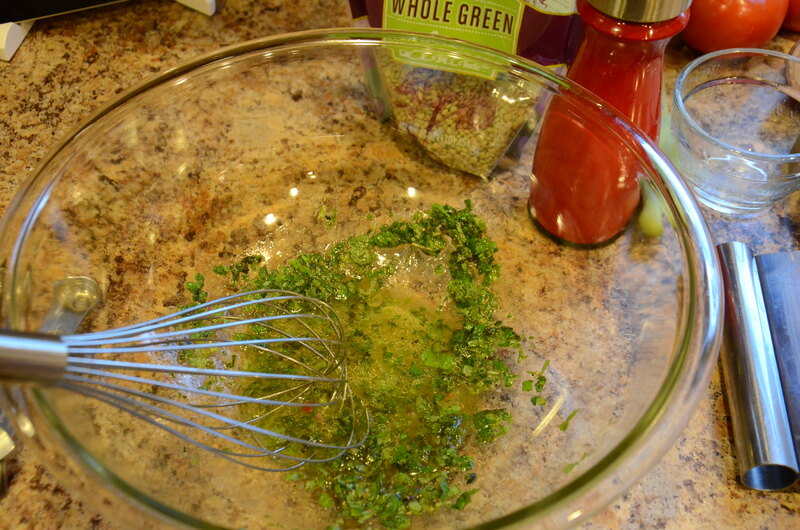 For the dressing: in a large bowl, whisk together lime juice, mint, 3 tablespoons extra-virgin olive oil, remaining 1/4 teaspoon cumin, and 1/4 teaspoon each salt and black pepper. 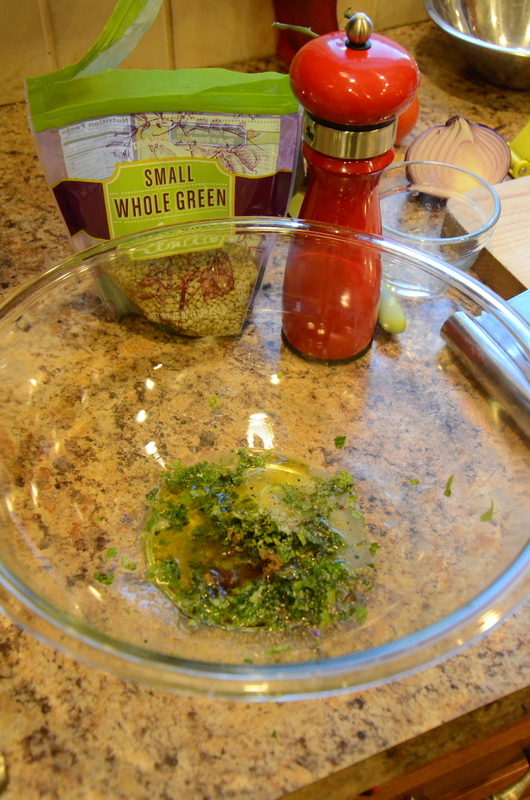 Add hot lentils and vegetables to dressing; toss until well coated. Divide greens among serving plates. 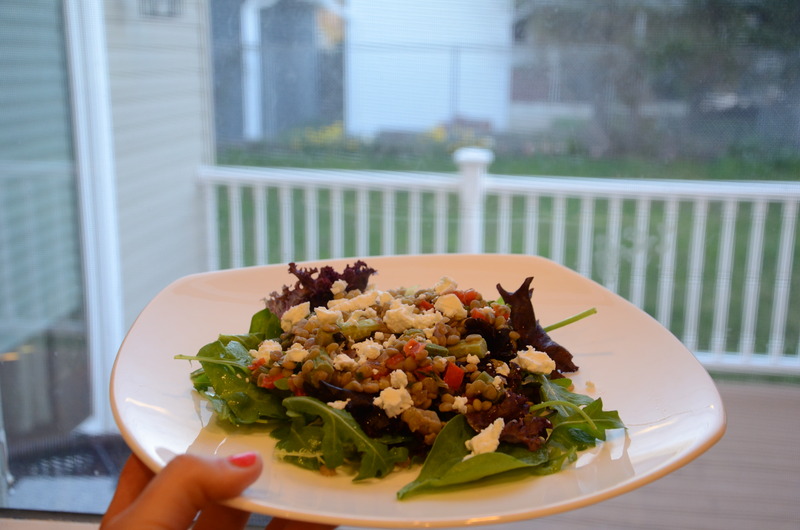 Top with lentil mixture and goat cheese. I ate this warm for dinner. I took a leftover serving to work the next day and ate it cold for lunch–it works that way too! I mentioned the high protein content earlier, and the high fiber also makes it filling. Those facts were clear later in the afternoon, when I felt no need for a 2:30pm snack. HIGHLY unusual. 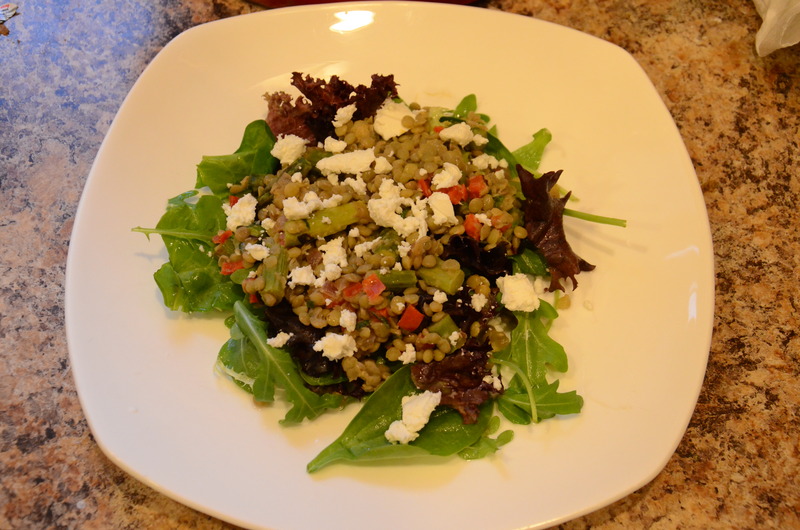 This entry was posted in Great leftovers for lunch, Lentils, Recipes. Bookmark the permalink.